Michael Management Corporation, a leader of award-winning SAP training solutions, has rolled out its annual spring SAP training course catalog. With 18 new courses and over 50 additional hours of new training released in 2013, the catalog update accurately reflects the MMC offerings. 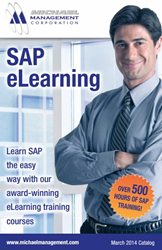 Michael Management Corporation provides over 1,000 hands-on SAP eLearning simulations in more than 85 courses that educate trainees on critical functions of the SAP system, from basic introductory courses to intermediate and advanced classes. With additional courses being added each month, it is necessary to offer a way to easily navigate the course catalog and update biannually. In addition, the course catalog includes MMC’s development roadmap to outline new training courses that are currently being developed by MMC’s expert SAP training designers. Trainees can explore six curriculum plans, which help instruct individuals on which courses to take and in what order to complete those courses. This is especially helpful for individuals who seek our training for their own benefit, as well as for corporate professional development managers who may not be very familiar with SAP but who are responsible for suggesting coursework for their employees. All of MMC’s training solutions are also available for corporate customers as comprehensive multiuser training accounts. All corporate training accounts include a cloud-based learning management system as well as extensive adminsistration, reporting and tracking functionality. This allows training administrators to monitor the progress of their training programs with ease and efficiency. For companies with specific business requirements that extend beyond MMC’s existing SAP training courses, MMC offers the option for custom eLearning development. MMC works directly with organizations to design and develop simulations mirroring the exact system version, configuration and business process used. As all custom eLearning courses are SCORM compliant, organizations can upload and publish from their own LMS or MMC can host the course through their award-winning LMS system.